Want a chance to win all of these highly anticipated 2015 ARCs? Is that THE WINNER'S CRIME I see? Well, I'll tell you more about that in one minute. Thanks to the fabulous people at Macmillan, I had the honor of interviewing Sandy Hall, author of Swoon Reads first published novel, A LITTLE SOMETHING DIFFERENT. Y'all, I read devoured this novel last week, and it is SUPER cute! If you haven't read A LITTLE SOMETHING DIFFERENT yet, this interview will definitely make you want to ASAP. Without further ado, here's Sandy! How did you come up with the storyline for A LITTLE SOMETHING DIFFERENT? Why did you decide to write this novel in 14 different points of view? These first two questions have related answers because the idea for the book came about in a bunch of different ways. As a teen librarian, I know what my kids at work are looking for and what they're not finding on the shelf. Several years ago, I had a teen ask why there weren't many books about the first year of college. I filed that question away, thinking that if I ever wrote a book it should show normal everyday college life. Then when I heard about Swoon Reads I asked some teens what kind of romance they'd like to read. And one of the girls gave me a long paragraph about a boy and a girl who live parallel lives that never intersect. I loved the idea of that story, but felt like it'd been written many times. BUT! I realized that if I got out of the main characters' heads, and told it from everyone else's point of view, that it would be something different. And definitely nothing that I'd personally read before. Which character in your novel do you relate the most with? I like to think that there's someone in this book for everyone, but I feel like I personally relate to all of them in one way or another. Although I recently took a quiz that Swoon had linked on their website to find out which ALSD character you are and I got Victor. If you could pair Gabe and Lea with other fictional characters, who would they be and why? Oh gosh, as much as I love this question it's so hard for me to answer! I like to think of ALSD as sort of an ode to shipping and Gabe and Lea are the OTP of everyone in the book, and they're definitely mine. I just like them together so much that my brain is rejecting any legitimate answers. 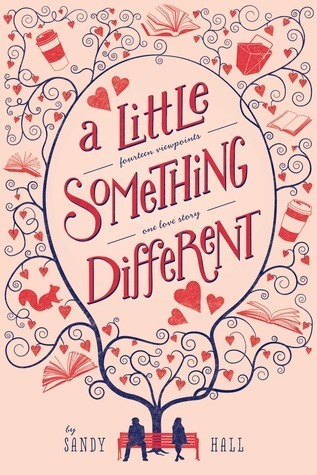 What's your favorite quote from A LITTLE SOMETHING DIFFERENT? It's not so much a quote, but a moment. When Gabe is reading his essay about himself and compares his shyness to the bicycle that grew into the tree. It's the first bit of Gabe characterization I came up with and I really love that image. Care to share what you're currently reading and working on now? Reading-wise, I'm catching up on my lengthy TBR list. I have a ton of ARCs from Book Expo that I haven't touched yet, not to mention all the great books that came out while I was busy editing and touring. I listened to I'll Give You the Sun by Jandy Nelson over the weekend and I loved it. It was such a great story to immerse myself in while I was driving to Virginia for a convention. Writing-wise, I'm one of those people that doesn't like to talk about what they're walking on until it's done. Otherwise I feel like I could jinx myself. But I'm definitely working on another romance! Sandy, thank you so much for taking the time to answer a few questions for us. Now, it's giveaway time! Let's take a second and take a look at the prize again, shall we? I'm seriously jealous of the winner here! To enter, all you have to do is fill out the Rafflecopter form below. This giveaway is only open to US participants and ends October 25th. Good luck, and may the odds be ever in your favor. "The creative writing teacher, the delivery guy, the local Starbucks baristas, his best friend, her roommate, and the squirrel in the park all have one thing in common—they believe that Gabe and Lea should get together. Lea and Gabe are in the same creative writing class. They get the same pop culture references, order the same Chinese food, and hang out in the same places. Unfortunately, Lea is reserved, Gabe has issues, and despite their initial mutual crush, it looks like they are never going to work things out. But somehow even when nothing is going on, something is happening between them, and everyone can see it. Their creative writing teacher pushes them together. The baristas at Starbucks watch their relationship like a TV show. Their bus driver tells his wife about them. The waitress at the diner automatically seats them together. Even the squirrel who lives on the college green believes in their relationship. Surely Gabe and Lea will figure out that they are meant to be together...."
I'm a high school librarian. It's the best job in the world! 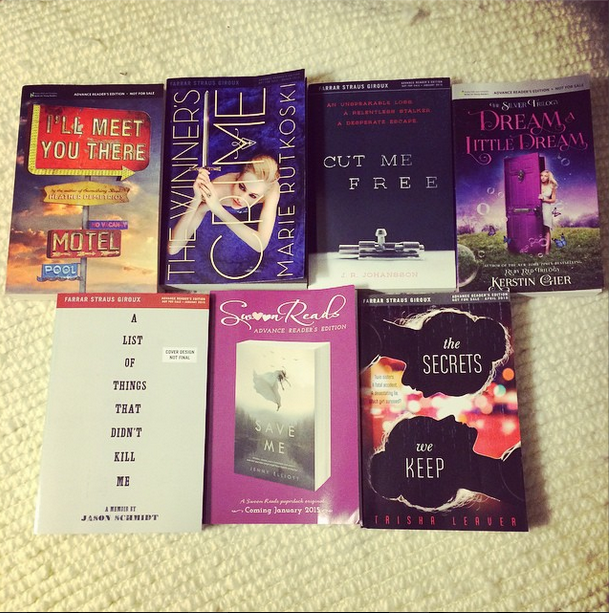 What an awesome selection of ARCs! Congrats Sandy! I can't wait to read this book. It sounds really fabulous. Thank you for the interview, I always love hearing from an author. I am so excited for A Little Something Different. I'm actually disappointed in the fact that I haven't read it yet. So excited! I recently bought Sandy's book, because I am ALL for shipping. Also, I loved the idea of having all these different perspectives shipping theses two characters. It sounds so fun and sweet! Great interview! P.S. Love the blog layout! Words cannot express how excited I am to read A Little Something Different! I enjoyed the interview! Thank you for the giveaway!! I have A Little Something Different up to read soon and I'm really looking forward to it. ALSD is one of the cutest books I've read all year. Can't wait for 2015's offerings. I loved Something A Little Different. Thank you for the giveaway! A little Something Different was super cute and I can't wait to see what you give us next! Thank you for the amazing giveaway! Great interview, I haven't heard about this book before, but whoa at 14 POVs in it. Thanks Sandy, I cant wait to read your book. This book sounds so interesting. And I love the cover. I just added it to my TBR list and hope that I will get the chance to read it soon. What a great interview. Thank you so much for the giveaway! Your book sounds brilliant!! And the cover is soooooo pretty! :D Thank you! Great interview and such a unique approach to a story! I really liked A Little Something Different and look forward to the next Swoon read! This giveaway is amazing, thank you so much! Eep! Wonderful interview and amazing stack of books!! Thank you so much for the giveaway! Thank you so much for the wonderful giveaway!!! :D I still need to get my hands on this book, I want to read it so bad!!! Benarkah Teh Hijau Adalah Penyebab Penyakit Hepatitis?